About Huizhou Huiderui Lithium Battery Tech Co.
Huizhou Huiderui Lithium Battery Technology Co., Ltd is a high-tech innovation company and focus on Primary Lithium Battery R&D, manufacture and sales, its core team has been working in Primary Lithium Battery industry since year 2003 with rich experience and skill. 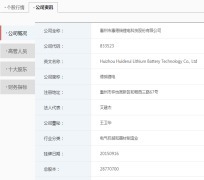 The company was listed in NEEQ on September 16th, 2015, stock code: 833523.Our major product includes 3.0V Lithium Manganese Dioxide (Li/MnO2) batteries, 3.0V Thin Film batteries, 1.5V Lithium Iron Disulfide (Li/FeS2) batteries and 9.0V Lithium Manganese Dioxide (Li/MnO2) batteries. Our batteries compete with world class enterprises, like Panasonic in overseas market. Our R&D capabilities are extraordinary due to many high educated battery & equipment experts with rich experience in battery field and who have numbers of patents. Huiderui has been approved by ISO9001:2008 and ISO14001 and got the certificates for CE, UL, UN and SGS(RoHS). Our batteries are utilized in the fields for electricity meter, water meter, gas meter, heat meter, security, medical treatment, GPS, RFID and military etc.